When I first became engaged to my husband-to-be, I was invited to visit for the first time with the Springer Family in Hollywood, Florida; to be introduced to the family and friends during an evening reception at their home. There was a lovely buffet of appetizers and desserts for everyone’s enjoyment while the cocktails were served. Since I do not like alcoholic drinks I went straight to the dessert section of the buffet. Holding a plate in my hand I picked up something small. It was a square little bite that looked simple but intriguing. The little piece was light brown in color with chocolate pieces peaking out of its cake. It had no icing or any kind of cream on it which promised my fingers would not get messy or sticky. It definitely was a very safe bite that would not even mess up my lipstick, yes, I am vain when it comes to looking my best and this was an evening when I wanted to be as “perfect” as I could. Today I want to share my version of this simple little cake/pastry and hope you will bake it as often as I have throughout my many years of marriage…after all it is my husband’s favorite treat. Add the light brown sugar to the melted margarine and add the 3 eggs one at a time while mixing well with an electric hand mixer. Remember, every oven is heating differently, check the pastry before the 35 minutes, it might be baked sooner than you think. Cut the “cookies’ into little squares and dust them with a touch of powdered sugar before you place them on a serving platter. The powdered sugar is my Austrian signature! 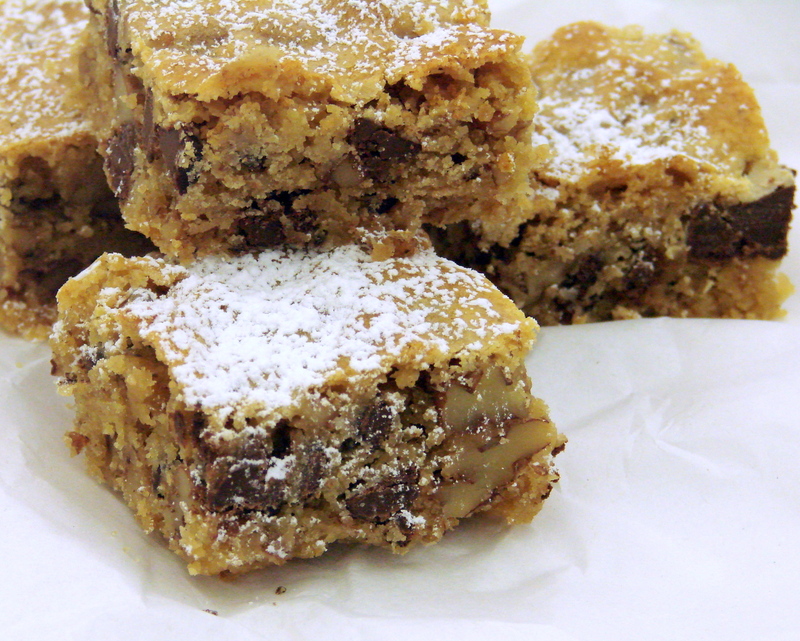 Paul has been requesting blondies for nearly all his dessert choices recently. I’ll try your recipe the next time he asks. They look great. 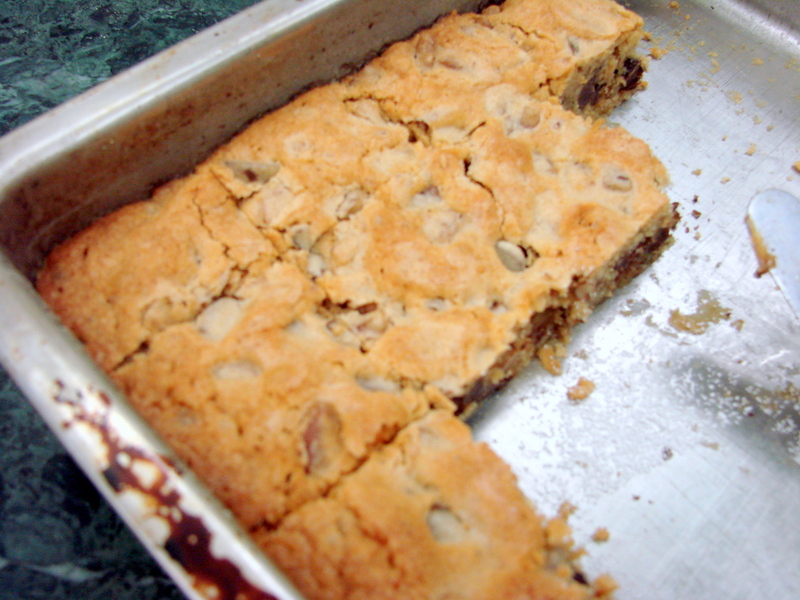 Hi Scotte…..loved receiving your comment…and I hope you have made these Blondies for Paul by now….our were gone in no time…. 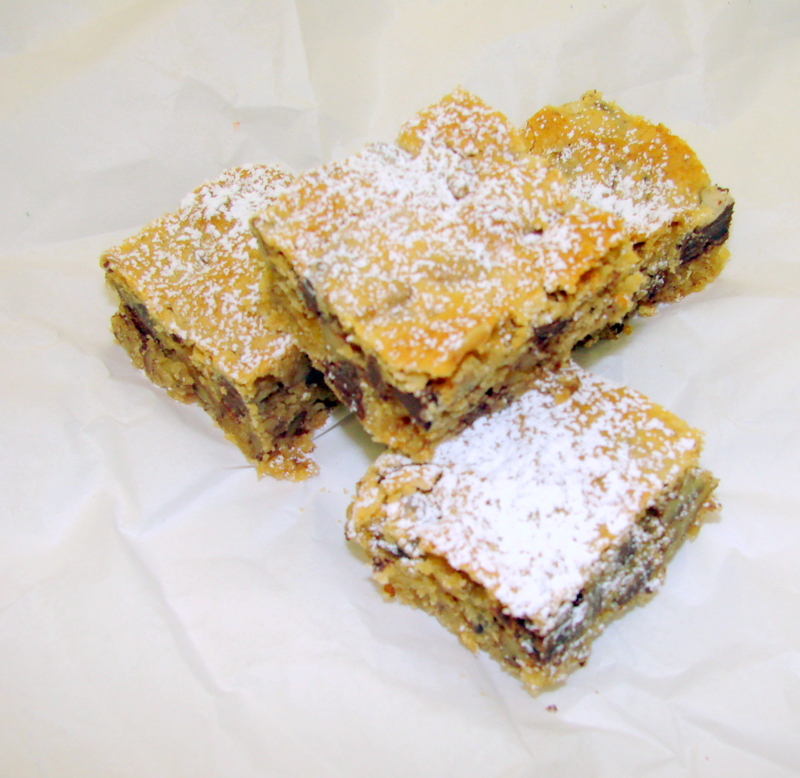 Hello Maria Larese…so nice to have you here…and I am happy to hear that you have a similar pastry that you make in Italy….I went to your blog…but, could not find the cake that is supposed to be similar to the blondies…Let me know the date you posted it…thanks…hugs to you…. Sounds lovely! I do like the stories that come along with our recipes! They make the baking and eating more meaningful. Hi Sue…..Elenore – was a friend of Dale’s mother…she used to live near the highschool….are you making these Blondies as well? Hugs to you! Dear Maria, These bars are by far my favorite and I love that gorgeous crust on yours! 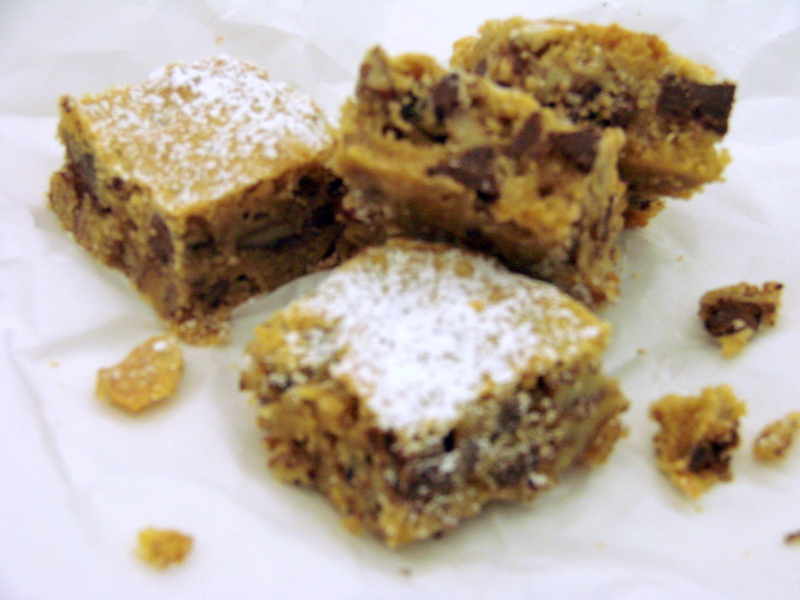 Hi Devaki….thank you for stopping bye….it is always nice hearing from you….and thank you for your kind compliment about the crust on these so delicious “Blondies.” Hugs to you! They look so yummy! Glad you added your Austian touch. Maria, Sorry that I spelled Austrian incorrectly on my previous post. These look so delicious I could eat the whole pan! Caterina….these are delicious….but, nothing will surpass your “Mummsie’s Cookies”…..thank you for dropping bye…..love you!